An Asian Handicap is a form of betting that gives a team a head start in the game by either putting the stronger team on minus number of goals or the weaker team on plus number of goals. The term originated in Indonesia back in 1998 and over the last 10 years the bet has grown in popularity somewhat. It works in a very similar way to the standard handicap but with the Asian Handicap the draw is removed from the equation, so you either win the bet or you lose the bet. Asian Handicaps generally offer better odds than a standard handicap so if you like handicap betting you should really take a bit of time to truly understand the Asian Handicap system and see how you could boost your profits without necessarily increasing your win-rate. The 0.0 Asian Handicap works the exact same way as the ‘Draw No Bet’ (DNB) option. Neither team will start with an advantage and if the team you back wins, you win, and if the team you back loses, you lose! So, what happens if the match is a draw? Well, you get your money back, the bet is void! Just like it never even happened. If you regularly use the Draw No Bet option, you really should compare the odds of that bet to the odds of the 0.00 Asian Handicap. I am very confident that the Asian Handicap odds will be better nearly always. A 0.25 Asian Handicap (also known as ‘0.00, 0.50 Asian Handicap’) splits your bet in half and creates 2 bets. The first bet is on the 0.00 Asian Handicap and the second bet is on the 0.50 Asian Handicap. So if you stake 10 units you will have a 5 unit stake on each handicap. Assuming you went for the -0.25 option you would need your team to win the match to see your max return as just a 1-0 win would see your 0.00 Asian Handicap bet win and also your -0.50 Asian Handicap bet would win. If your team were to draw then you would lose half of your stake as you would get a refund on the 0.0 Asian Handicap bet but you would lose your stake on the -0.50 Asian Handicap because your team didn’t win. You would make a loss in this situation. This would work the opposite way if you chose the +0.25 Asian Handicap because if you team was to draw you would win the +0.50 Asian Handicap bet with the 0.00 Asian handicap bet still being void. You would make a profit in this situation. The 0.50 Asian Handicaps take out the draw option so with these you either win or you lose. So they are, in effect, the same as the standard European Handicap which I’m sure more people are aware of. The good thing about the Asian style is they give better odds over the standard handicap so you should always be looking at the 0.5 Asian Handicaps when you are considering a standard -1 Handicap. You will nearly always get better odds. Using the -0.5 Asian Handicap is the same as picking a team for a straight win. If they win, you win, if they draw or lose, you lose. Again, you usually get better odds with the Asian Handicap. The +0.5 Asian Handicap gives you the draw as well as the win so your bet is the same as the standard Double Chance option but with better odds. A 0.75 Asian Handicap (also known as ‘0.50, 1.00 Asian Handicap’) works in a very similar way to the 0.25 Asian Handicap. Your bet is again split into 2 bets with half your stake on the 0.50 Asian Handicap and the other half on the 1.00 Asian Handicap. If you took the ‘+’ handicap both of the bets would win if your team won or drew, this would see a maximum return. If your team lost by 1 goal you would lose the +0.50 Asian Handicap bet and receive a refund on the +1.00 Asian Handicap bet so this result would see a half stake loss. If your team lost by 2 or more goals the bet would lose and you would lose all of your stake. If you took the ‘-’ handicap both of the bets would win if your team won by 2 or more goals, this would see a maximum return. If your team won by 1 goal you would win the -0.50 Asian Handicap bet and receive a refund on the -1.00 Asian Handicap bet so this result would see a profit. If your team drew or lost the bet would lose and you would lose all of your stake. The -1.00 or +1.00 Asian Handicaps are very simple to understand and are probably the most popular of all the Asian Handicaps that are on offer. The -1 Asian Handicap basically gives your team a 1 goal deficit from the start. So the score would start -1-0 and for this bet to win your team would need to win by 2 goals. For example, if your team won 2-0 and your bet was with a -1 Asian Handicap the actual score would be 1-0 because of the 1 goal deficit at the start. If your team won 1-0 the score would be 0-0 and as there are no draws with the Asian Handicap your bet would be void and you would get a refund. If your team lost 1-3 the actual score for the bet would be 0-3 so you would lose the bet. The +1 Asian Handicap works the opposite way. The team you back would get a 1-0 head start on their opponents so you would usually use this bet on the underdogs. Again, for example, if your team won 1-0 the score for the bet would be 2-0 because of the 1-0 head start. If your team lost 1-0 the bet would be void as the score line would be 1-1. If your team lost by 2 goals the bet would lose. As you could probably guess, the -2, -3, +2, +3 Asian Handicaps etc. work the same way but with different goal advantages/disadvantages. Below is a simple chat which explains everything I have said above but in a much quicker way. Asian Handicaps are great when you get to grips with them and they nearly always offer better odds than their equivalent in the standard betting options. 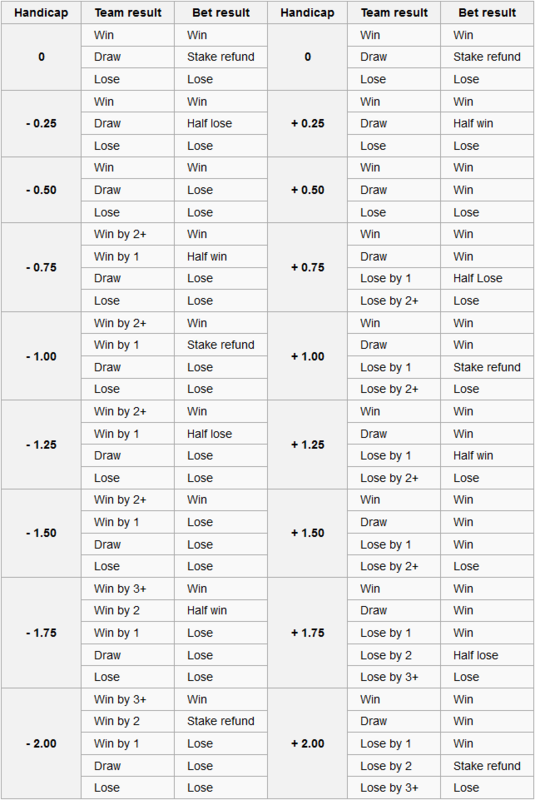 See the table below for further explanation of the Asian Handicap betting method.